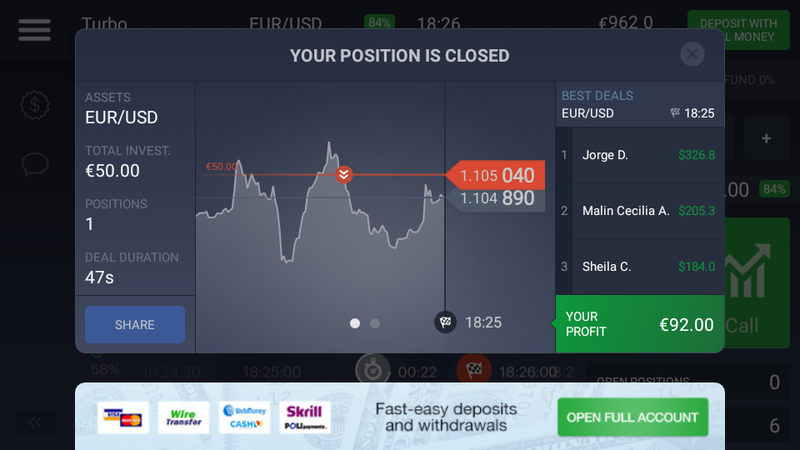 I finally tried one of the many Binary Options trading apps that popped up on one of the ads on my phone the other day. 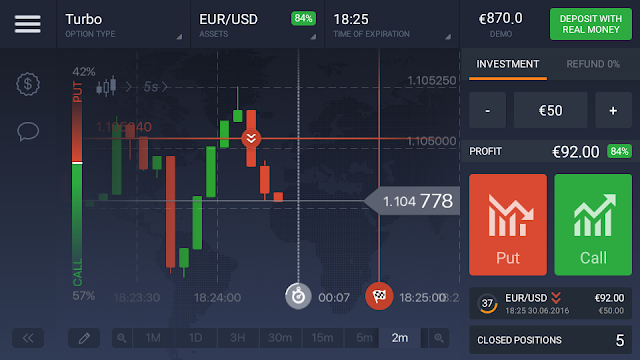 This one is called 'IQ Option', and looked professional enough to give a try. 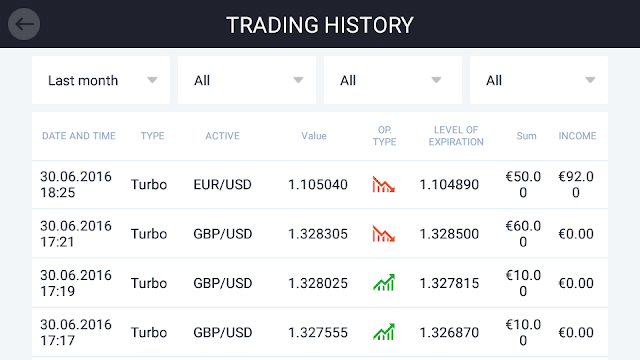 After I registered I opened a Demo account to start trading with a fictitious €1000. 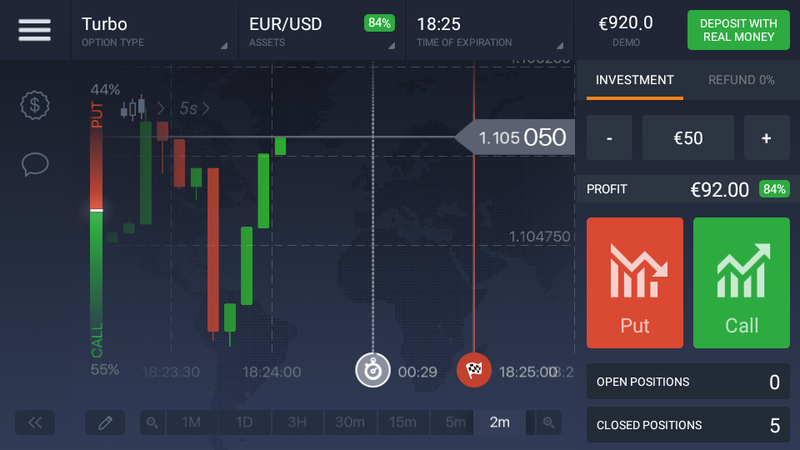 For those who are unfamiliar with Binary Options trading, let me give you a brief explanation. 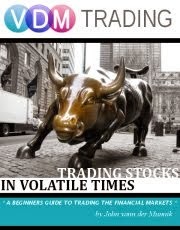 Basically it's like normal trading but this time your trades are under a time constraint. With regular options this is usually a few months, now your options will expire within a few minutes or seconds after you've placed an order. It's simple to understand: will your trade go up (call option) or down (put option) after it expires within the given time frame. And believe me those times are very short, especially when you select the 'Turbo' option type. When you start trading the EUR/USD for instance you can see the bars on the chart moving rapidly up and down. Now let's place your bets, will the currency pair close higher or lower when the time runs out (red flag on the image). For this trade I entered a put option (short). As you can see this option will expire in 37 seconds(!). It's the little circle under the big red 'Put' button on the image, and my wager is €50. If I win I get €92, if I lose I lose my bet of €50. This time I am a 'winner'! And I just made €92. That's a €42 profit in 37 seconds! This is what I call beginners luck, because most of my trades (read: bets) didn't go so well. I actually lost my entire €1000 in a matter of a day! Sometimes you win, but in my case I lost most of the time. And I have been trading regular stocks and options etc. for years! This Binary Options trading app should be part of an online casino. It really should! I don't see any difference in placing a bet on the roulette table (red or black) or simply saying higher or lower and wait half a minute. 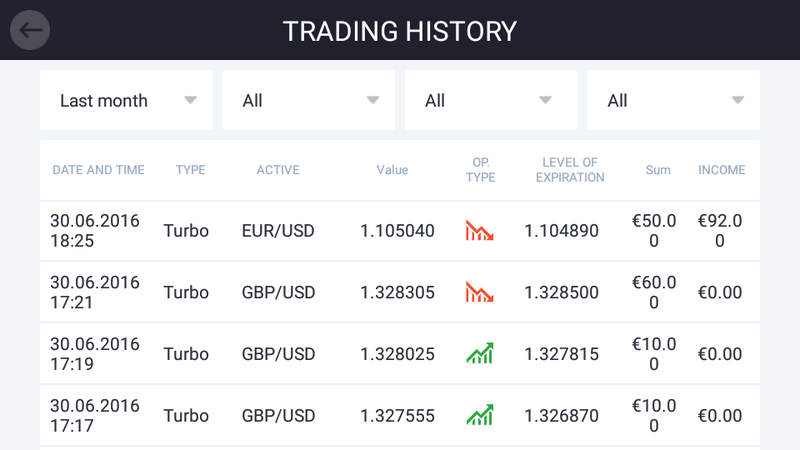 You probably noticed that I started to refer to the trades as bets, because in my opinion that is exactly what they are. I love how the IQ Option app classifies your winnings as 'income' to make it sound as you can actually make a living out of this. Easy to understand and easy to trade, in particularly with your cell phone, but Binary Options trading falls in the same category as gambling in my book. There is no way you can make profitable trades consistently. Anyone who claims that's possible is not telling the truth and is probably working for an options broker. Sure, you may win the first time or even a second or third. The bottom line however is that eventually you will lose your entire investment. The risk is simply too high! This has nothing to do with actual (options) trading, where consistent profits are possible by conducting proper market research. This moves so fast that even normal jumps in the market can cost you. If you like gambling and trading then this might be something for you. My advice however: stay away from it, it will cost you! !